It’s not necessary to tell much about Las Vegas. The whole world knows what this city is and it’s enough just to mention its name to cause the image of a bright and colourful picture. The city is full of both casino lovers and impressed tourists. During 20 years the city came up from the desert and turned into the gambling capital of the USA and also of the whole world. Almost every hotel in Las Vegas is also a gambling place, that’s why it’s not easy to resist the temptation of playing the money. Riot of color and vivid city’s decoration just boggles the imagination. The best way to move comfortably within the city and also to visit as more sights of the States as possible is to use car rental services. You can rent a car in the airport of Las Vegas or order a car directly to the hotel. 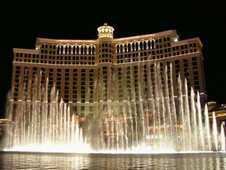 On the bookingcar.ru website you can check the best car rental deals in Las Vegas and easily book a good car. Note that the traffic signs in the USA differ from those in Russia. They can be just inscriptions without any conventional symbols. There are no problems with parking in Las Vegas. All hotels in the city provide spacious free parking lots. In addition, if you need, a parking attendant can drive your car to the parking place and back by their own. Gratuity in this case is usually 2-3 dollars. In DownTown the parkings are usually paid but there is always a possibility to park for free. Even in the centre of the city. In spite of the fact that Las Vegas is associated with exhilaration, alcohol, and night entertainments, the traffic rules’ observance is strictly controlled here. Driving under the influence is not an exception. Maximum blood alcohol concentration is 0,08 ‰. If this level is exceeded, the violator is punished with a fine, confiscation of a driver's license or even the police detention – it depends on the level of intoxication. This rule must be treated very seriously not to have spoiled rest. In spite of the fact that the traffic rules in the USA varies from state to state, and one must learn them beforehand, there are the rules, which must be observed irrespectively of the state. Firstly, all the passengers must buckle up the safety belts. Besides, in the USA observance of the parking rules is strictly controlled. It is strictly forbidden, for example, to park a car in places marked for the disabled. Pay attention to the traffic signs and plates, which can indicate the permission or prohibition of parking in the area. Filling stations in Las Vegas are automatic with paying by credit cards. However, if there are any problems with your card, you can pay with cash in the cash desk. Note that the prices for fuel are presented for a gallon, which equates to approximately 3,79 litres. Gasoline costs about $ 3,30 per gallon. Fuel's quality is good; however, the USA is often low on gasoline, so there can be imposed some restrictions for filling. San Francisco from 18 eur a day. I spent the weekend in Italy and didn't miss the opportunity to drive a rented sports car. Of course, at home of the most supercars there is no other way. I rented the car via this resource. I can't say that it is cheap, but not enormously expensive. For me, it's important that this is the only car search engine that has found the required car. The payment is direct without fees here. I deliberately asked the provider about the price at the destination place. There was no difference in price. I recommend it to everyone.